Takashimizu history began in 1944 after merging of 12 small breweries during World War II. In this column, we will trace the history of 12 breweries which are the foundation of current Takashimizu one by one. We will introduce “Hachiryu” this time as the ninth brewery out of 12. Keisuke Ota began his sake business at current Funakoshi, Oga city in Akita prefecture in 1915. An ancestor of Ota family was a prestigious family which had moved to Oga city from Aizu-Wakamatsu in Fukushima prefecture and had a role of Kimoiri (village head) and Honjin (post town) for generations since Edo period, and was permitted the status of “Myoji-taito” (the right to bear a surname and to wear a sword). While they had practiced medicine and drug trader for generations, Keisuke worked on increasing the dwelling lands and fields positively and started the sake making as a main purpose of the effective practical use of the rice harvested from there. Their brand name “Hachiryu” is named after the place “Hachiro-gata” where is located at the base of the Oga Peninsula. Hachiro-gata had been the second largest lake after Lake Biwa in Shiga prefecture until its reclamation in 1957. At present, almost all water areas have turned into lands; however, there is a myth that a dragon which has been changed from a human, named Hachiro Taro, chose this place as his home after his wandering, and it is said that this myth became the origin of the brand name. In addition to “Hachiryu”, they also used about five to six brand names such as “Kanpu-zan”, “Fukuizumi” “Hatsuzakura”, and so forth, and established the firm market around the Oga Peninsula. The picture above is a sake pot of “Hachiryu” which remains at Ota family. 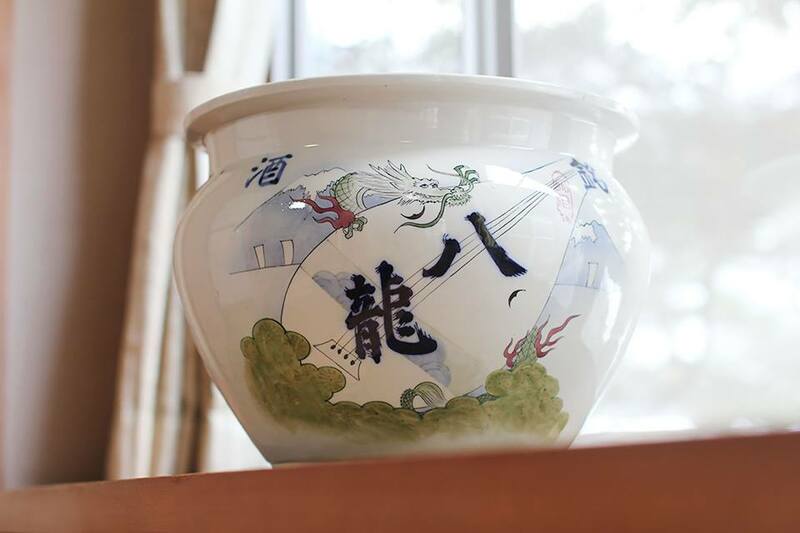 You can see the drawing of the four-stringed Japanese lute called “biwa” and a dragon behind the brand name which was drawn powerfully in the center of the pot. From this colorful and powerful drawing, you can easily imagine the scene of the Akita’s folktales “Hachiro taro”, can’t you?